The department offers the Master of Arts and the Master of Science degrees in chemistry and cooperates with the Applied Science Program in offering the Applied Science Ph.D. in applied chemistry. The M.A. and M.S. degree curricula are a blend of traditional and nontraditional innovative courses that reflect the needs of modern chemistry. Research-quality instrumentation and computer facilities are available to students, as well as individual attention and a high quality of instruction. Academically talented undergraduate chemistry students may schedule courses on an accelerated basis and enroll in selected graduate courses in their senior year. Students may receive a master’s degree one year after completing the BS degree. This program is an option only for students who have excellent academic records for the first three years of undergraduate study and have completed the suggested 108 hours of undergraduate work through the junior year. Permission for early enrollment in graduate courses in the senior year must be obtained from the dean of the Graduate School on recommendation of the department chairperson. Students registered for graduate credit in dual-listed (4000/5000) courses are responsible for additional assigned work. Details of the bachelor’s/master’s program, including a suggested five-year sequence, are available from the chemistry department office. A limited number of graduate assistantships are available. Contact the program coordinator for information. International applicants for teaching assistantships must have an overall score of at least 50 on the Test of Spoken English (the testing facility must send scores to the program coordinator). 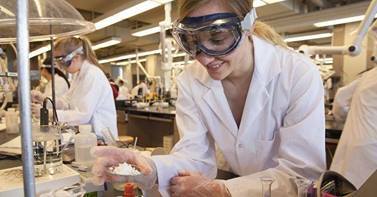 Both chemistry degrees require at least 30 graduate chemistry hours, including at least three of four core courses (CHEM 7311 Analytical, 7340 Inorganic, 7350 Organic, 7370 Physical), as determined by the department’s graduate programs committee. The master of science degree requires CHEM 8100-8400 Thesis Research and 7190 Graduate Seminar. The student selects a thesis advisor and a specific thesis research project, then researches, writes, and orally defends a thesis (11 credit hours). For the master of arts degree, 12 approved course hours replace the thesis and seminar hours. The remaining hours are elective and might include graduate chemistry courses of specific interest to the student; up to three graduate chemistry hours transferred from another school; up to three approved graduate hours from another UALR department; or up to six 5000-level hours. Successful completion of written thesis and oral defense (M.S. only).